I remember when I first heard about beauty routines that include nearly a dozen steps. Despite the inevitable damage it would cause to my bank account, the self-care aficionado inside me immediately jumped aboard by filling my medicine cabinet with every new product category I read about. Years later I still swear by a double cleanse for fresh skin, toner for balance, serums to correct, and so forth. But there's always been one product that left me bored: eye cream. Often created with the intent to remove dark circles, smooth fine lines, and de-puff the area under your unpleasantly-tired eyes, they did nothing for me. However, I didn't give up and hoped that I just hadn't found the one for me. (Very Bachelorette of me, right?) I found myself purchasing every formula a coworker would rave about, but each time I felt like I landed on Bachelor In Paradise instead of my own show. Then everything changed when I found an eye serum that left my quest totally vindicated. Indie Lee's potent serum gave me immediate results and after only two days, I noticed that I looked well-rested despite a lack of sleep, the stress of New York's humid weather, and several glasses of wine that I've had this week. The texture is closer to a serum — and not like the rich creams you've tried before — and leaves skin feeling a slight tingle. It's all thanks to the more-natural ingredient list, which includes horse chestnut, ash bud, and witch hazel. I'd bet that everyone will appreciate how quickly this serum soaks in, but some might be turned off by the tingle. I love it because it's like a wake up call in the morning and it's a nice reminder that the product is doing its job. What's more, it also serves as a great primer for my concealer, so you can skip the powder and live your best dewy life. Ultimately, if you're tired of looking like you binged a certain ABC show all night, know that there is eye product out there that turned this skeptic into a believer. 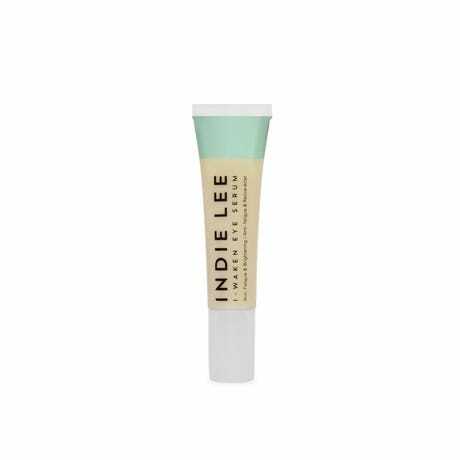 Indie Lee I-Waken Eye Serum, $48, available at indielee.com.